Ultrasound in December 2018 was normal including normal axillae. However this week lump was found in arm (not armpit) about 2 or 3 inches from the armpit. General physician on clinical exam found no lumps in armpits but confirmed lump was swollen axillary lymph node but normal. I am not sure if I should be worried. I have had swollen lymph nodes in both groin areas, neck, collar bone, shoulders and armpits. I have taken antibiotics and they have not gone away or down. I had a mammogram in August with a lump in my right breast and the radiologist seemed concerned saying it could possibly be precancerous and requested to have another mammogram in March. My doctor is just now starting tests like ultrasound of my neck. I hope this is the right direction we should be going. I also have a high WBC count with low RBC. The lymph node on my left side has on and off swelling for a couple months. Doctor said it was from a sinus infection and gave me antibiotics. It's been another month and it still swells on and off. About 6 years ago, I had lymph nodes behind my ear swell up and move down my neck. They would move down a few inches a day. After a week or so, they stopped, then swelled up to baseball size in my neck and were extremely painful. I had a doctor cut and drain one, then remove another to be biopsied. The biopsy came back benign. He put me on antibiotics, we tried 3 or 4 different ones until the infection and swelling went down, but the lymph node swelling never did. Just recently, they have flared back up in my neck. I have had swollen lymph nodes for 6 months now. Ultrasound confirmed they were reactive. One has once swollen to the size of a tennis ball. I had mammogram, blood work every 2nd month, chest x-ray, core biopsy, fine needle biopsy - all clear. Finally I had a surgery to remove one the size of a golf ball and still no clear diagnosis. Pathologists are baffled and it is becoming a case study. I am very active but do feel tired more than usual and my night sweats could be attributed to hot flushes. I have an enlarged lymph node in the groin. I noticed it about 3 weeks ago and went to my primary physician because I was getting sticking pains in my lower pelvic area. She thought it was urinary tract infection but I didn't think so, and she put me on Bactrim and did nothing. She felt my groin area again and said this past Friday that I need ultra sound of pelvic area and to see the surgeon for biopsy. Ultra sound is normal. Primary doctor calls me and says to go see a hematologist oncologist but I have appointment for consult with a surgeon. The node has to come out. I don't know if I need to see a hematologist. I felt warmth in the right side of my jaw, and my dentist sent me for CT. The result was as follows: multiple small lymph nodes, less than 0.5 centimeters are appreciated at the submental group, both submandibular regions, superficial to the right parotid gland as well as the deep cervical groups bilaterally. I am so concerned, I am a 41 years old male. My lymph nodes became swollen about 3 weeks ago. I didn't pay it any mind because it wasn't painful until one night I couldn't swallow and I had to drink water to get the lump out of my throat. About the third week the pain became unbearable. I couldn't eat and a little bump under my tongue would grow as I ate. With Google you begin to self-diagnose yourself thinking the worst. So I went to urgent care only to find out that I had a bad dental job (root canal) and the infection was under my cap. I began to take antibiotics and by day 3 I could eat again. I have to follow up with my dentist because after all the money I spent, the root canal may have been a waste of money and I still may have to get it redone. Hopefully this eases some tension and you go get yourself cheeked. I have a swollen lymph node on the right side of my neck, this was determined by a CT scan. The doctor said that it is not cancerous. It is the size of a small marble, it is quite painful and I was told that therapy could help with the pain. I started out with bronchitis and then was treated for asthma for 8 months. After numerous pulmonary doctor visits and 3 emergency room visits they finally did a CT scan that showed scattered lymph node swellings over my whole body. After removal of a lymph node I was diagnosed with MCD (multicentric Castleman's disease). It is an autoimmune disease that is very rare. They also think that I have Churg-Strauss syndrome which is another rare auto immune disease. We are most likely going to get a lung biopsy to check on the Churg-Strauss. I just finished my 6 dose of Sylvant for the Castleman's and am waiting to see the results. About a month ago I had pain and severe night sweating. I felt a lymph node on the side of my neck discovered 3 months ago quite big. I had a mastectomy 41 years ago at the age of 29. One of a twin identical, she also had a mastectomy 4 years after me and died at the age of 38. I saw a doctor and blood tests showed an infection and I was put on antibiotics for a week. I wonder if the node will go away or if I should have a biopsy done. I am just worried. I am 26 and I had a partial thyroidectomy 11 years ago. Recently via ultrasound and biopsy I found out that that I got a new, very small sized nodule/goiter in the left thyroid gland (which was not operated). Doctors said it has a normal range, but required checkup. Now, all of a sudden I felt some small nodule like tissue under the right jaw of my neck. I got extremely worried, thinking that I might have gotten a second nodule now. However, I have been sick recently with cold, sore throat, coughing, running nose, even fever once. Then it struck me that it is possible that I might just have a swollen lymph due to my sickness. Something positive in a sea of negative. I do not have lymphoma. Sigh! I have spent countless hours researching and playing Google doctor. I was certain I had lymphoma. I just found out a few hours back I did not have it. I have lots of cervical swollen lymph nodes, a few in my groin, and one that I can feel in my left armpit. The one in my neck was 1.2 cm when they took it out. The one is my armpit is close to that size. All others are enlarged but not considered abnormal. I have had blood work, CT scan with contrast (neck only), chest x-ray, and now I have had a lymph node biopsy (node removed from my neck). I now need to go down the path of what else could be causing this. My surgeon is in surgery today and my general doctor doesn't work Mondays, so hopefully tomorrow I learn what to do next. I will end up sharing my entire story when I know what it is, but for now I wanted to add another positive story into the sea of negative. I have had mononucleosis before in my adolescence. I am currently a 31 year old female. I am active and a fairly healthy eater. I have two kids, I am currently nursing my youngest, so I wonder if the biopsy was a false negative. If it's not cancer then why in the world do I have so many swollen nodes! I do not have any other symptoms. The lymph nodes do not hurt. I have been camping so the next thing I wonder for is Lyme disease, but no symptoms of similarity other than swollen nodes. Good luck to everyone! The lymph node under my left arm has been swollen since August when I was diagnosed with atrial fibrillation. The atrial fibrillation is now under control but the pain still generates down the inside of my left arm from the armpit to almost the elbow. My doctor had me take a mammogram which came back normal, and manually checked my breasts and couldn't find anything. She has checked my lungs with the stethoscope and all sounds normal. I'm seeing a surgeon tomorrow to see if I need a biopsy of my lymph nodes. I have had two types of cancer, colon and pancreatic. One third of my colon was removed in 2005 and I had Whipple surgery for the pancreatic cancer on 12/30/09. Now I have new lymph nodes developing attached to my renal artery. There is also a tumor growing very slowly in the body and tail of my pancreas. There is swelling in the new lymph nodes. I had/have swollen lymph nodes in my neck both sides to the armpit, it affected my hearing as well. I could not walk 10 feet without feeling like I ran 20 miles. I told my dad and he said it sounds like the mumps. I felt like it was meningitis and the mumps. I went to the emergency room and the doctor after a two minute exam said cat scratch fever. So now after months all this had started with parasites. My husband had severe pain in his right groin. He then developed a fever that, in total, lasted 2 weeks, up and down along with night sweats. His fever would spike in the evening. Most days he could go to work, but felt awful. Almost immediately after the fever he developed a lump in his groin where the severe pain was located and it was getting worse. We then decided to go to the emergency room. They felt it was a swollen lymph node and viral and would take care of itself. Well, it did not subside and we decided to go to our family doctor who felt it was infection and put him on a strong antibiotic. This did nothing and he developed abdominal pain and vomiting which sent him to the emergency room again. They admitted him and did more testing as they couldn't find a cause. A team of oncologists figured it was either infectious or cancer and decided to remove the lymph. The surgeon said that the lymph node was a mess and just fell apart upon removal. He was in the hospital for 5 days and when the pathology report came back we found out that it was not cancer but was infectious and the results were almost conclusive of cat scratch disease. He did have a puncture wound from our kitten on his right foot that wouldn't heal, but we never linked the two together. He is feeling much better now and on the mend. I had a severe earache which caused swelling inside the ear and the lymph nodes around the ear also swelled making me look like I had the mumps. After 5 days the lymph nodes around my neck also started swelling and moved to the right side causing that ear to also swell inside and out. My forehead looked as if I had a severe sunburn and is now actually peeling as if I did burn. My doctor did a blood test that showed I had rheumatoid arthritis. The only thing she zeroed in on was the rash on my forehead, I wonder how this rash helped her reach this conclusion. I have been having a lump below my chin and in the upper part of the center of my throat for 3 months now, which I think are maybe swollen lymph nodes. Some days I feel like it is choking me or I'm having difficulty in breathing. I am not sure which test to do for this or which specific doctor to consult. My son's throat hurts and his lymph nodes are swollen, started yesterday. I am go try the warm compression and see how it works out. My husband has a swollen lymph node on the right side of his groin and it makes his stomach hurt to the point he wants to hardly eat, and he throws up. I have got lower back lumps; very painful. I had x-rays done but they are clear. Moment I wake up from bed or chair I get a stabbing pain. I hunch my back for a few minutes then straighten up, but there is pain still. I need help to try and identify if these are swollen lymph nodes. Sometimes it feels like the lump is moving upwards. I am just getting over bronchitis and the lymph nodes on both sides of my neck under my jaw are swollen and very tender. I've never had this before and I'm not worried about it, but I'm just curious if the area under your tongue on the sides is supposed to be so painful as a result of lymph nodes. It is especially bad when I eat anything. I have swollen lymph gland at top of right leg, plus gentle coughing up of mucus. It is probably due to a cut on my right toe. I am taking antibiotics but getting worse! I have swollen lymph nodes on my neck and the nurse said it is because I am HIV positive though I have lived with the virus the past 8 years. I have been struggling with stress the past few months. My lymph nodes behind my ears are swollen since I had a cervical fusion a year and a half ago. They took the bone from my hip. I've noticed that I had a swollen lymph node on the right side of my neck about two weeks ago, my overall health is ok, I exercise every day and I eat healthy food. I've had exams last month and I was extremely stressed during that period. I wonder if it is possible that this has occurred due to stress or if there is a chance for another reason. My wife is a patient of swollen lymph nodes and the submandibular gland. She was operated 6 years back (2009) and her left submandibular gland was removed. She had severe pains at left of neck under the ear and severe pains in ear and head region. Now after 6 years she had the same symptoms but found a hard knot at the same place surrounding the lymph node in the area. CT scan was done and report showed the swelling of nodes covered with the mass accumulated around it. At last she was operated at the same place and two lymph nodes were removed by surgery. I showered around 7 pm on Thursday the 3rd of September and noticed a swelling under my right armpit. It hurts if I press on it, and it is like a nagging pain all the way into my breast. I'm kind of worried because I have been itching in both of my arms and only up in the forearm area. I don't have any cuts or bad bruising. I am very concerned. Cancer is in my family on both sides, my mother's and my dad's. I awoke at 5 am with my neck and shoulders hurting really badly. I could not move my right arm away from my body any more than 12 inch. In addition I could not straighten out my right leg. I figured I must have slept wrong. As the day progressed my symptoms grew worse. My entire body hurt and I started running a 101.0 fever. All that happened yesterday. Today my body aches are better, although I still have extreme difficulty raising my right arm and my neck hurts. I now also have what I believe to be a swollen lymph gland located on and around my clavicle, on the left side of my body. It is very painful, any movement causes it to hurt. I have been having problems with several of my teeth (molars on the left side) and several days before all this started I had a terrible tooth ache. Living in a rural area it makes it difficult to get right in to a doctor. I do have several teeth that need to be pulled, but the dentist said let's hold off until we decided whether to have implants placed. I have had swollen lymph nodes in my left side armpit for over a year. Now I have them under the right armpit and they itch a lot. Today I was in the emergency room and I have swollen lymph nodes on the back of my neck which are causing muscle pain in my shoulders. I have been fighting an infection, sinus, and pneumonia for 3 months. It started with the flu. Now my lymph nodes by my lungs are enlarged. Two doctors said it is because of infection, one is trying to get me to have more tests and see a pulmonary doctor. I do not believe in seeing all these doctors or have these tests. I think bacteria has caused my swollen nymph nodes. There are white smelly chunks in the sides of my throat. Sometimes when I swallow it feels like there's something stuck in my throat, that's what made me examine it. I push on it and the white stuff squeezes out, and sometimes it can be a bit painful. In May my doctor noticed that lymph nodes in my neck where enlarged. I went back for checkup in November when I was getting over a cold. The doctor said my lymph nodes where still enlarged. He ordered ultra sound which came back with two large lymph nodes on right side of neck and one on left side of neck. The doctor referred me to ENT doctor who wants to do an endoscopy. I wonder why the doctor wouldn't order to have a biopsy instead. The enlarged lymph nodes are in my neck, not my throat. I have had swollen lymph nodes under left arm, left neck and collarbone for 4 months. Surgeon removed the ones under the left arm and they were benign. I continue to be sick with flu like symptoms all the time. I have fever, sore throat, cough, achiness all over and extreme fatigue. Doctor gave me steroid pills for a week and it was the best 7 days of my 61 years. I had no pain, no swelling, no cough, no sore throat, and most of all, more energy than I have had in 45 years. He couldn't give me more than one week of them due to side effects, I guess. I am heading to see rheumatologist next month. I think this all started with a chronic pain for 2 years somewhere under my left shoulder blade. I have a swollen hard knot right above my collar bone at the base of my neck on the left side. Not especially sore when palpitated. It has been there for about a week. I have a cough with sticky mucus. My lungs are clear. Seems to originate around my vocal cords. I have two small hard lumps in the left groin. I had groin pain about three weeks ago and my doctor prescribed antibiotics for a slight bladder infection. Yesterday morning I noticed a lump under my left armpit. It feels tender to the touch. Day 2 it feels more swollen and my inner elbow now feels tender to the touch and slightly swollen. My glands have been swollen since August. I thought it was just allergies and as time went on the season changed so I thought it was a sore throat. But my throat does not hurt. My glands are swollen and it constantly feels like someone is choking me, not to mention it is now starting to hurt. I entered the hospital with upper right pain, I thought it was my gall-bladder. After having a sonogram, CT with contrast, MRI, and then a scope, I was told it wasn't my gall-bladder. Doctor said I have an enlarged lymph node. They were going to do a biopsy but said that the location of node was too close to arteries and were afraid I might bleed. I had a severe cut to my finger which required removal of glass and stitches. Several days later I noticed the lymph nodes around my groin area became swollen. I have had fever and some night sweats. Other than being sore I go about my daily life. About 5pm. I will feel feverish. I take some Tylenol and then I seem to be ok. I was diagnosed with CLL a few months go, but white blood count has gone down. I went to my hematologist and he was puzzled. No sore throat or sign of lymph node activity anywhere else. He wants to wait another week of so and just see if the inflammation will go way. Hello I have had swollen lymph nodes (in my neck) since I had a really bad sore throat and cold in April. It is mid June, and my lymph nodes are still swollen, they constantly ache and cause pain in my teeth. Sometimes they hurt more if I am tired, and less after sleep. It would be a great help if you could give me any ideas of what the problem is, and what I need to do to take care of it. Thank you so much for your help! Personally, my lymph node under my right arm pit was related to the fact that I had a breast lump the size of a walnut under the same side of my right breast as the lymph node was discovered. However, the lymph node was puss and blood filled and I had put hot compresses on it which helped until I would be able to get to my oncologists office. My doctor luckily sent me for a breast MRI due to the fact that my mammogram didn't come back with the best results either! I treated it like acne and it actually worked to help relieve the pain and swelling and actually opened it up, let everything inside of it, out! It actually undid itself while was sitting at church and had raised my hand and put it back down, actually had to change my blouse when I got home its the hugest lymph node I ever had in whole life, it was really frightening to have too and painful, it had steadily become more and more painful and itchy as the days progressed! I have small lumps, not tender, not moveable, hard, firm and fixed behind the left ear and the swollen lymph nodes has been there over a month. I have large bumps on the right side of my neck towards back of neck. I think they are swollen lymph nodes. I have swollen occipital lymph nodes with pain down the neck. Whenever I chew food the left side of my neck swells and it is tender. Then after I finish eating I have this aching pain, then the swelling goes away. I have had a 3rd occurrence of cellulitis in my left leg. I have been hospitalized and treated with antibiotics. I now have a swelling in one of my ears in the canal with pain in the jaw. I am also still on oral antibiotic. I have been sick with a cold. I sweated out my fever, but after a week I am still with the cold. I went to the emergency room. They did a CAT scan which says I have a touch of pneumonia in my lungs. However my concern is I woke up this morning and my right side of my neck lymph node is swollen extremely big. I have swollen lymph nodes in the neck glands and have trouble breathing at night. When I lie down to go to sleep I start to have trouble breathing properly and start coughing up nasty stuff. This only happens at night when I am tired and ready to go to bed. Sitting up helps, but not much. My lymph nodes or swollen, there is a big red ball under my left arm pit which is tender to touch. My shoulders are swollen and when touched they are round and painful and they cause headache. It has been a while now and I wonder what the problem could be. And I feel pain at the groin. My lymph nodes are swollen and I am sick at my stomach, also throwing up badly. I wonder if can be caused by my lymph nodes. I have swollen lymph nodes under the arms. I got a swollen lymph node 3 days ago, it is badly swollen. I went to the hospital and they gave me 500 mg amoxicillin 3/day. It doesnt work and doctor doesnt seem to care. I got 2 more last night. I feel like I have an infection in my body. There are left-sided level III lymph nodes measuring up to 0.6 cm and left level IV lymph nodes measuring up 0.5 cm. There are also level I lymph nodes measuring up to 0.5 cm bilaterally. There are level II lymph nodes measuring up to 0.8 cm on the left and 0.7 cm on the right. I have a small lump on the right side at the back of my head and it hurts when it lay on it or touch it. I think it is a swollen lymph node. I have had it only two days, wonder if I should see a doctor or wait a little longer. I have a swelling that hurts at times below my right ear and just behind the right, lower jaw hinge. I have just had a serious bout of shingles. I have swollen lymph nodes in my neck, underarm and groin. I wonder if this can be due to the shingles or there could be a more serious underlying condition. I have sub mandibular lymph node enlargement on both sides for about 2 years, small and palpable and I have some amount of sputum in the morning and I have no any other symptoms. I have swollen lymph nodes in the neck, near the ear in the neck and one underarm. The one in the neck near the right ear is very painful. I have been experiencing joint pains and fever associated with the chikungunya virus. On the third day I notice a swollen lymph node at the side of my face right next to my ear at the temple then the following day many other just seem to have sprung up out of nowhere at the back of my neck, underarm, and in the groin region. I had a bilateral mastectomy for invasive breast cancer 7 weeks ago. About a week ago I noticed there is swelling from just under my collar bone all the way over to my right arm pit. I'm wondering what is going on here. I am having this problem with swollen lymph nodes on my neck, shoulder, upper back, and groin. Both of my parents died of cancer. A 3.1cm lymph node was picked up on a routine carotid ultrasound. I have no symptoms and I am being sent for a CT of the abdomen and pelvic areas with contrast, and also CT chest. I have a lump, on the left side of my neck, under my jaw. I went to the doctors and he feels this is a lymph node, sitting, on the bone. I'm having a scan done, as soon as possible. I have axillary swollen lymph nodes under both arms, which are very painful. I have had CT scan and ultra sound. They hurt so much, it feels as if my whole chest and ribcage hurt. My son has several swollen lymph nodes in his neck, jaw, and chest area. The one on his jaw is very large and hard and getting bigger. He had blood work done and an ultrasound. Now we are going in for X-ray and biopsy. I'm very concerned. I happened to notice on my left side of my neck was a nodule and suspected I had a swollen lymph node. My doctor ran a CT scan and it came back in fact I had one. He gave me an order to have a biopsy done. I have had a couple of swollen lymph nodes in my neck just under my jaw for three months now, with no symptoms. Three ultrasounds and a blood test haven't given any clues as to why they are swollen thus far. I am seeing an ear, nose, and throat (ENT) specialist next, hoping that he will have some answers. I have swollen inguinal lymph nodes since my period started two days ago. I usually have severe cramps and pain, but I have never had swollen glands before during my period. I'm not sure if I should see a doctor now or wait to see if it goes away after my period. My 70 year old female friend has had a very swollen leg for many, many years and has been in a lot of pain the whole time. She has just had tests done and they seem to think her swollen leg is due to lymph nodes. I have swollen lymph nodes in my neck for about 2-1/2 months. I've had some achiness in the neck, along with some pain in my chest. I've also had night sweats off and on in during this period. My lower back hurts in the morning and it's hard to get up. I don't have any fevers, but I'm tired a lot of the time. For the past 8 months, I've had swollen glands on the right side of my neck and on the sides by my throat. The throat is usually in the evenings, I wake up every night roasting and sweating, a pretty constant headache starting in mid-day and worse by night. When I pointed this out to two different physicians, they just blew it off. Now I am very tired, sleeping whenever I can and it feels like my temperature is up but unable to take it. The swelling on the right side of my neck is always there but actually gets bigger at times and then returns to the smaller size. My son has a history of cancer. He has been cancer free for over 20 years. His lymph nodes in his neck are swelled and hard and have been this way for 2 to 3 weeks. He went to the doctor today and blood work was done and an appointment was set up with a surgeon for a biopsy. How concerned should I be? I will tell you now, that I am very concerned. I have 3 swollen lymph nodes on the left side of my hair line on my neck and one on the right side. I saw my doctor he did a chest x-ray and blood-work. Everything came back normal. He gave me Keflex 500mg 4caps for 10 days. The doctor said it was just a lymph node and it was nothing to worry about. On my left arm, in the pit of it is a round area about the size of a quarter quite swollen and somewhat painful. 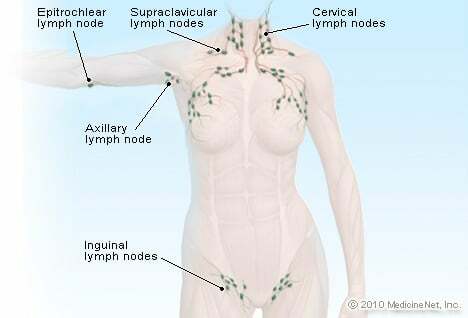 Under my left arm, where I learned there is an Epitrochlear Lymph Node; there is a lot of pain. The doctor had a blood test done for RA; which came back negative. I have a new doctor at the clinic, and this one seems to think it is nothing to worry about also. I wonder about the pain; if there is an infection that needs attention somewhere in my body. I seem to be the only one that cares about it. I would like to know what to do or where to go. After eating certain foods, my lymph nodes on one side of my throat just below the ear swells. It goes down with massage and or lots of water. I experience mostly discomfort and it is strange looking. I recently had a mammogram and it came back normal. I just started having pain under my left armpit mostly on the side. Is this something to be concerned about? I did a self breast check and cannot feel any lumps. I am also going through menopause. My daughter has a lump on the right side of her neck above the collarbone towards the back of her neck. This has grown in the last two months. She has lack of energy, sometimes gets cold and sometimes hot, but not relating to fever. It is not painful unless she lies on it or disturbs it by rubbing it. The sonar showed swollen lymph node and x-rays were clean. A new small lump has now developed on the opposite side. The doctor has diagnosed inflammation however this should not continue for 2 months or even grow. I have a swollen mass under the left armpit that seems like a swollen auxiliary lymph node after going through your website. It seems to be infected and resulting in abscess. I consulted a doctor and am on antibiotics right now. I have had numerous swollen, tender and red lymph nodes under my right arm for weeks now. They are starting to go down and now I have the same thing starting under the left arm! I have a persisting swelling of the lymph node under my left jaw. This has been bothering me for about 5 months. Just recently, I had bilateral mastectomies due to breast cancer. The left breast showed a non-invasive ductile carcinoma, while the right had invasive ductile carcinomas. My left side after mastectomies is bothering me a great deal in pain and swelling. Could the cancer (although it was NOT in my sentinel lymph nodes) be a cause of this lymph node swelling and tenderness under my jaw? I know a guy who said that he woke up with a huge bump on the side of his neck, right behind his ear. He said he was curious and worried about it, so he went to the doctor. The doctor gave him a prescription and said to come back if it didn't work. I was just wondering what the cause of this might be and what would happen if it did get worse and the prescription didn't work? My 81 year old mother had a CT ABD/pelvis and the only thing found was a "swollen lymph node next to the aorta.” They are watching it for 3 months and going to reevaluate at that time. I really need help I have been sick for over a year now off and on. The first time I went to the doctor with the swollen glands, sore throat, very fatigued, off and on fever, can't eat, body just hurts. They did a flu and mono, and nothing they said it was nothing. Now all this keeps coming back and each time it is worse, stays with me longer, and takes more out of me. This time right now it has stayed with me for two weeks. They said my liver count is high but then they said that's because am 50 lbs over weight. The liver count has been the same for a few years. Just got over having C Diff. I am so tired of the medical field I feel that some one needs to look at the whole picture. I don't know who or where to go from here I am so tired of this. I woke up this morning with my neck being double its size. My glands are swollen so much, I look horrible. It starts at my ears and radiates around my neck. I sat in emergency for 3 hours only for the doctor to tell me he doesn't know what is wrong, but probably a bacterial or a viral infection. He gave me antibiotics, just in case. I was diagnosed with several lymph nodes in my neck and one on my lung. When my CT scans were done, they were very large, but when I went to my ENT, he could not find or feel the lumps as they showed only on the scans. He said that he does not want to do the biopsy because they were 'melting away'. Should I get another opinion on this matter, or should I wait until the next three months as I was given by him, to see if the lymph nodes would go down on its own? Could this have been the result of Mono? I was told that my blood count showed a high level of Mono. For over 4 years I have had a swollen lymph node on the right side just below my jaw. I came to the conclusion that what I have is a swollen lymph node because of the explanations in this article. It's round, soft, and can be moveable to the sides. Since I've had it for so long, I'm afraid that it could be something malign. I want to know if the swollen lymph node will be something permanent that I would have? I also read that there's no treatment for it, but I want to know if it would be better to have it checked with a specialist? My husband has a swollen lymph node in his groin area. It's very tender and approximately 1.5" in length. He's had very little energy lately and digestion problems. I have a small swollen lump just under my jaw, this is causing me pain and is very tender and is also now travelling into my ear, coupled with this is a general feeling of being unwell, tiredness and weakness. This has all occurred over night. I had a swollen mass in left armpit approximately the size of a pea.